Did everyone have a delicious Thanksgiving? We sure did! After that, it was time to decorate for Christmas. I had picked up a few new things and placed them around the house over the last week, but the house was nowhere near photo ready. When I signed up to share the house in a tour today, I wasn’t counting on watching 6 hours of new Gilmore Girls on Friday. Or spending the hour after that trying to process the ending! Eventually, I recovered and finished the decorating just in time to take photos. Whew! Once I was done, I was grateful Carrie from Lovely, Etc organized this tour and invited me to join in. This year, I was all about white and metallic decor. I craved simplicity. I was also looking for items that could be used beyond Christmas as “winter” pieces. The “simple” plan worked great in the living room. I kept the navy accents and layered in white, gold, and greenery. I’m talking about the tree in another post next week, so you just get a peek at it today. For the mantel, I ordered the Stars Hollow print from my gift guide post. It’s so fun! A few years ago, I realized the glory of real garland. It’s a bit of a sticky mess, but looks and smells great! I did keep some traditional red in the kitchen. The old gas station numbers work so well over the stove. Above the shoe cabinet, you can see I was back to the neutral theme. On Wednesday, I’ll show you the close ups of that area. The prints all came from Minted, and they are letting me give away THREE $100 gift cards in the post (Sorry, the giveaway ended and all prizes have been claimed). Make sure you’re signed up for my emails so you don’t miss it! I had some other red decor I wanted to use, so I tried it in the bedroom on a whim. I didn’t really expect it to work with the pink walls, but it did! This may be my favorite Christmas room. I’m so glad I experimented and brought the pillows in to try. I called the bedroom my favorite, but I kinda forgot about the office when I said that. Can I have two favorites? I couldn’t wait to add a tree to the front window. We already owned a 4 ft tree and it fit perfectly between the chairs. It’s a good thing I didn’t have to buy a tree for the room, because I keep spending money on little paper houses. I don’t know how I’ve never been obsessed with them before, they’re adorable! I even found an easy way to decorate the shelves. I had a package of gold “Merry Christmas” ornaments and they are perfect in front of the gray bins! Now that I’ve shared our Christmas decor, I can’t wait to see what everyone else did! Simple was feeling right for me this year, but I bet I’ll be pinning all different styles for next year’s inspiration. 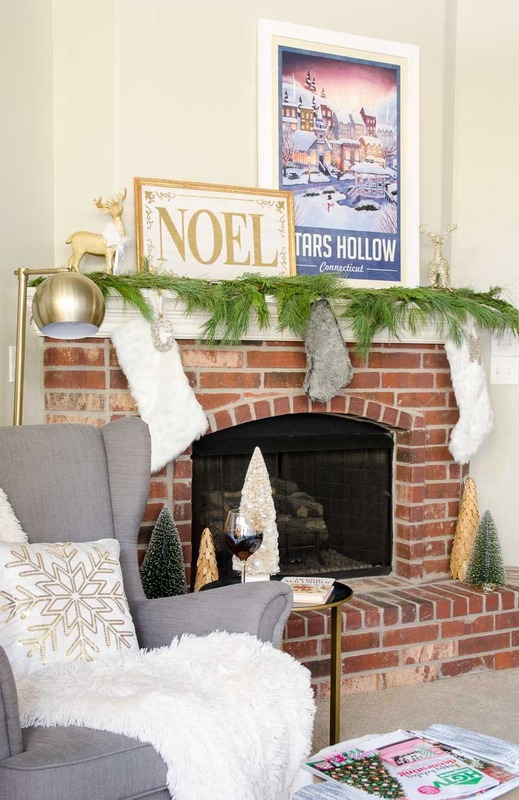 « Christmas Inspiration & $200 Pier 1 Giveaway! Wow, your home is so beautiful! I love how it feels very warm and inviting. Also the lighter tones with pops of color are perfection! That gallery wall in the living room is amazing. So many amazing details! Thank you, Emily! We do love our G’s. I always want the house to feel inviting, so I love that it felt that way to you! Oh my goodness! 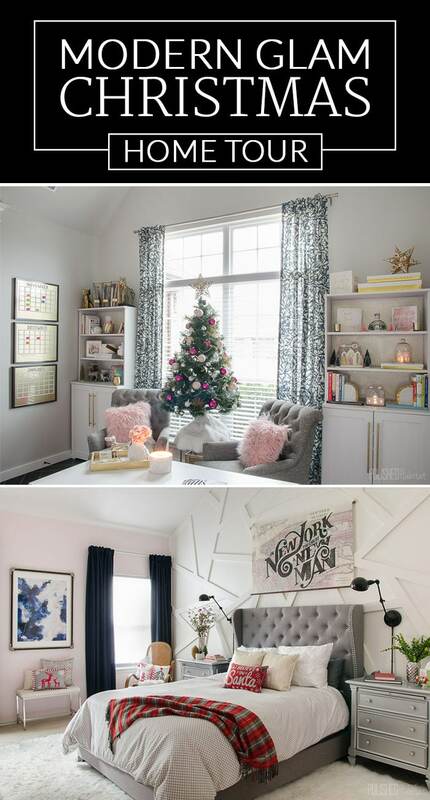 Your bedroom is just perfect for Christmas! 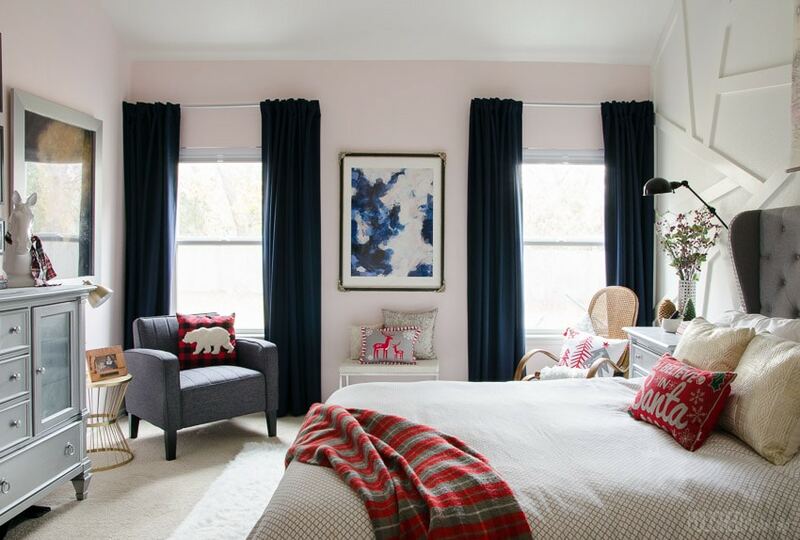 I love that plaid throw on the bed with the other touches of red in the room! And I’m also obsessed with those little paper houses… I need them in my life too! I believe this is my first time on your site (doing the blog hop with you) and I am absolutely smitten with your aesthetic. 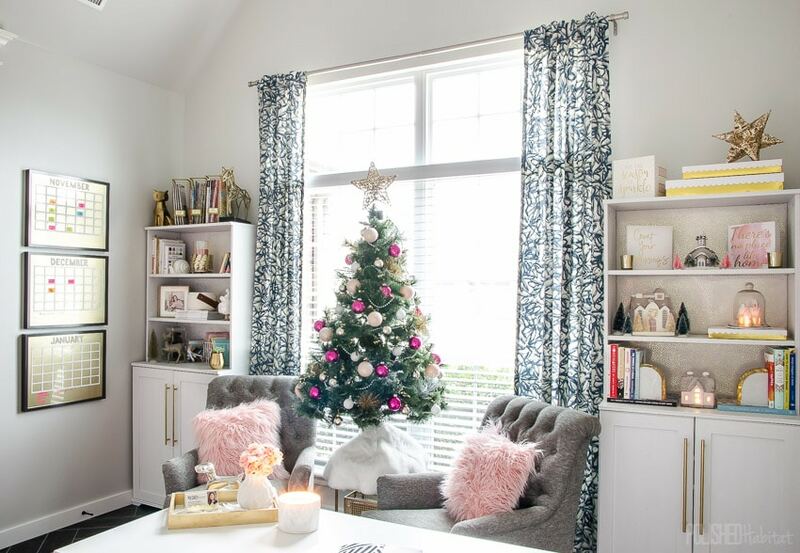 I love your glamorous take on the holidays and am obsessed with your bedroom. Beautiful job! So glad I came across your blog. Thanks, Erica! So glad we’re doing the hop together. I can’t wait to go see your tour later tonight! I love your home! What a beautiful space, and the Christmas decorations are just classy and perfect! That kitchen of yours is stunning! This is just a beautiful holiday home – I love every single photo and detail. I think the living room is my favorite – it’s just classy and chic. I also love the touches of red in your bedroom (I’m a bit of a red person all year, though). Fun idea to add the Merry Christmas ornaments to your shelves. Very creative. Thanks, Kim! I was so glad the red worked in the bedroom! 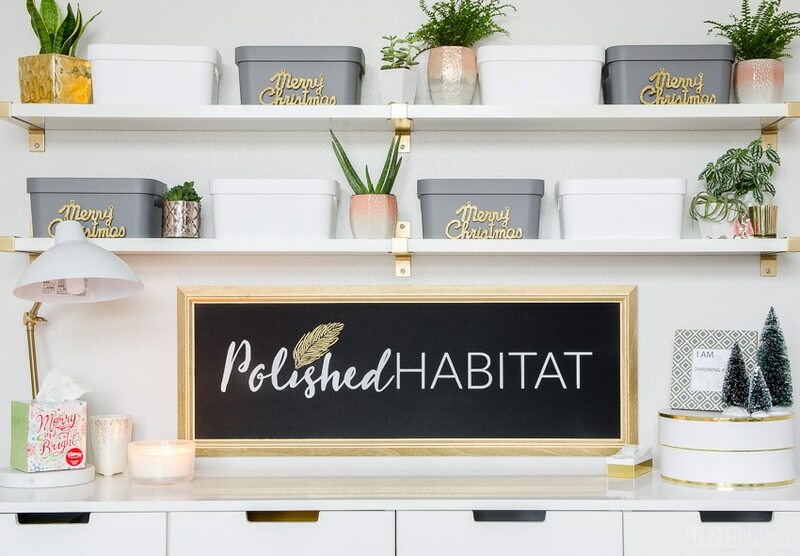 The red is the perfect addition to your bedroom, and I just love all of the holiday decor in your gorgeous new office! The office really looks like you designed it specifically to decorate it for Christmas! Thank you! Those little houses in the office are going to be sad to put away after the holidays! Looking great! 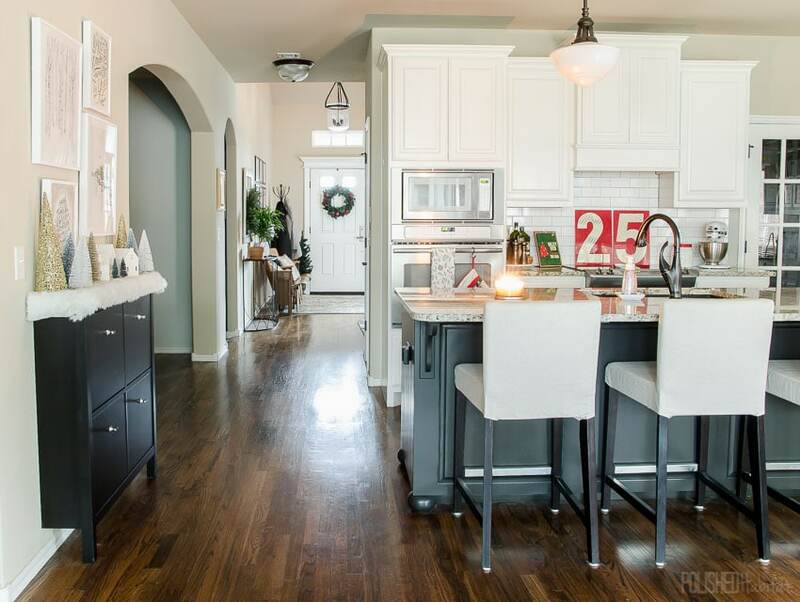 Those red numbers above your stove might be my very favorite–so cool! But there are so many great little touches–lovely! Thanks Gretchen. We have a few of those numbers and I was pretty excited when I realized the collection included a 2 & 5 for Christmas! 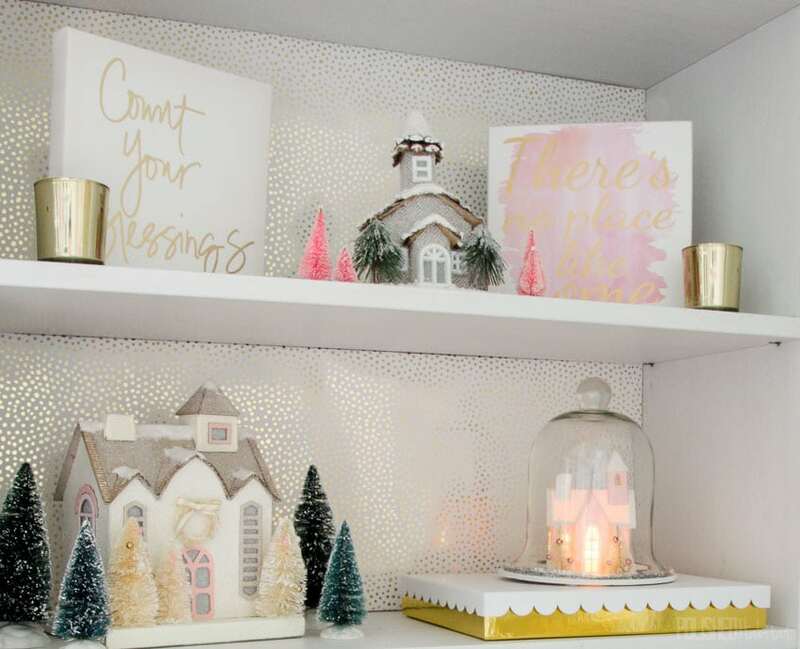 Girl, your home all dolled up for Christmas if gorgeous! 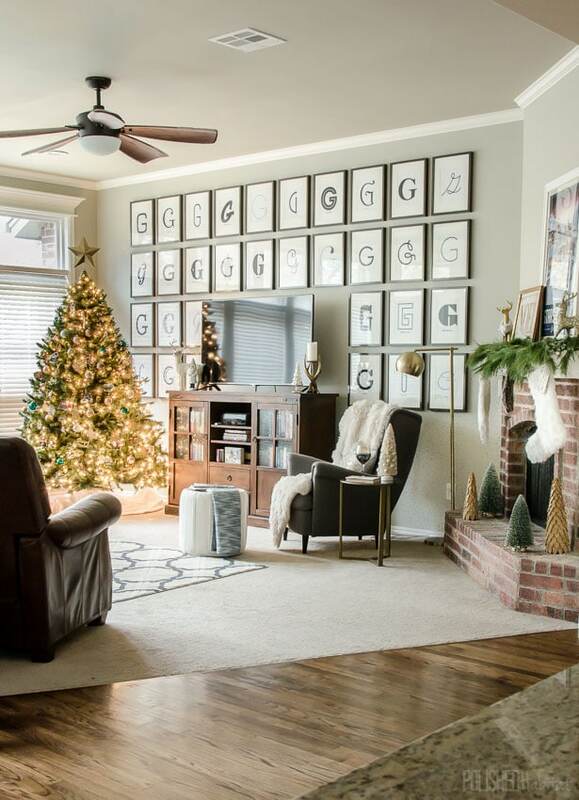 That Stars Hollow print above the fireplace is too cute. I loved everything! I’m a total sucker for your glam style. And those colors! All the holiday touches have a unique flair all your own! OMG, can I just say WOW! 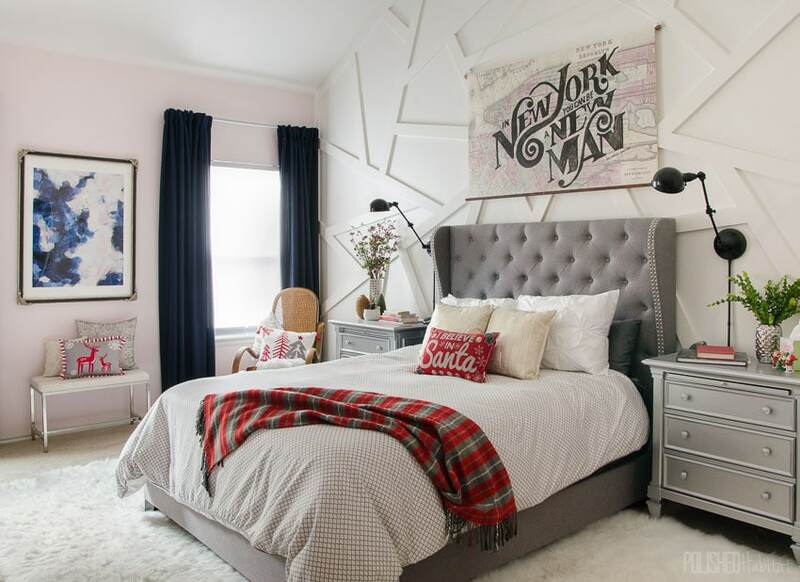 Your bedroom is AMAZING and the office, yes please. did you use wallpaper for the backing on your bookshelves? LOVE it! Thank you, Betty! I did the bookcases with wrapping paper from Target! Absolutely gorgeous!!! I can’t pick a favorite part! So perfect for the holidays! Have a very Merry Christmas! Hi Melissa, I love the little paper houses. Will you share where you got them? Thank you!? Love your white and metallic Christmas decor! My favorite thing is the gas station numbers! Swoon! SO perfect. It is ALL so gorgeous!! I’m with you…the pops of red DO work in the bedroom! I’m so happy you gave it a shot. And I’m also with you on the neutrals this year…I have a ton of neutral + metallic Christmas action going on this year and love it. 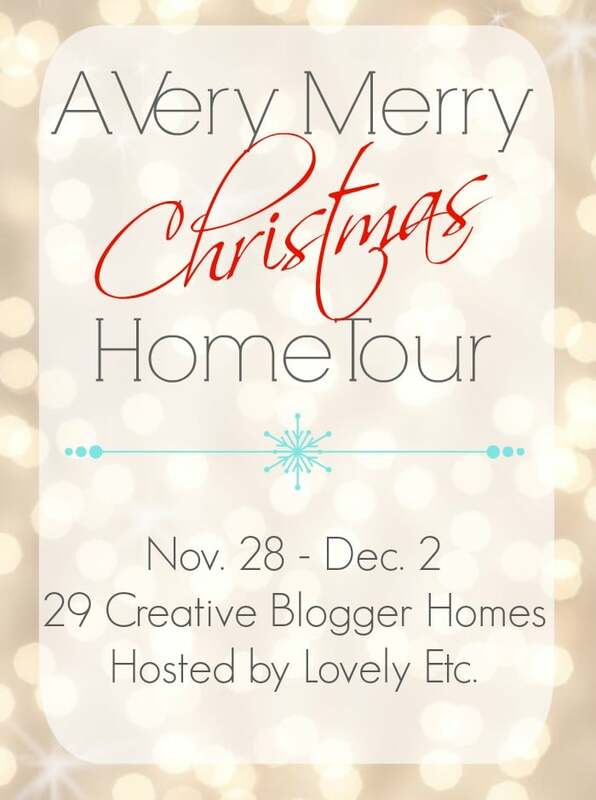 Cheers to December the start of home tour season! Beautiful job on your already beautiful home!! Simply beautiful! I especially love the little houses in your office. Can you share where you found them? Last year I found a couple of cute one’s at the Dollar Store of all places. I wanted to add a church this year, but waited too late to find one.